Now approaching half a century, Bumbershoot is one of Seattle's largest cultural touchstones. Each year, thousands of people from across the country flock to Seattle Center to attend this acclaimed festival, which has become one of the biggest and most-loved contemporary festivals in North America, while having maintained its Northwest spirit and innovative roots. 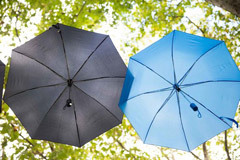 The name Bumbershoot was chosen both as a knowing nod of respect to our city’s most famous weather pattern, and a symbol of the overarching mission of this festival: to be an umbrella for all of the arts. Since 1972, Bumbershoot has been a multi-disciplinary arts festival showcasing the best of comedy, dance, film, literary arts, music, performing arts, theatre, visual arts and more. Spanning the Seattle Center grounds, a campus originally created for the 1962 World’s Fair, Bumbershoot has continued its legacy of celebrating innovation and the search for what’s next.